The name Philidor is inextricably bound up with the French Court. The first member of this family that we know is Michel Danican, who seems to have been of Scottish origin. His family name may have been a corruption of 'Duncan'. Michel was at the service of Louis XIII as an oboist. His sons Michel and Jean also worked for him; the latter is the first who is known with the adopted name of Philidor (or Filidor). Members of the following generations would play an important role at the court for more than a century. André Danican (c.1652-1730) acted as the Court's librarian and thanks to him a large amount of 17th century music has been preserved. He also arranged music for the Grande Écurie; recently an interesting disc was released which includes some of this repertoire (review). Anne Danican (1681-1728) founded the famous concert series Concert Spirituel where much of the latest music of the time was presented and many famous artists paraded their skills. François André is known not only as a musician and composer but also as a brilliant chess player. He played in several cities across Europe and was able to play blindfold chess with several world-class players at once. In 1749 he published a treatise, Analyse des échecs, which was reprinted many times. He started as a page-boy in the royal chapel, where he received his musical education from André Campra. He was active as a performer, teacher, copyist and composer and came into contact with some of the brightest minds of his time, such as Diderot and Rousseau. Most of his compositions date from the later stages of his life. He composed a number of comic operas; one of the features of his style was a strong Italian influence. In 1737 and 1738 Telemann was in Paris and some of the most famous musicians of their time performed his 'Paris' quartets at the Concert Spirituel. These made such a huge impression that the form of the quartet became quite fashionable. Several composers wrote quartets of their own, among them Philidor. In 1755 he published his L'Art de la Modulation, which included six quartets, although the individual pieces were called sinfonia. This is the Italian form of the French term symphonie which was used for any instrumental ensemble, small or large. The use of the Italian form bears witness to Philidor's Italian leanings and this is confirmed by the character indications which are also all Italian. The opening movements refer to the Corellian trio sonata, with indications like adagio and moderato. In some of the quartets the second movement is a fugue, again just like Corelli's trio sonatas. The closing movements are French dances, but they are called with their Italian names: the third quartet ends with a giga instead of a gigue. The last movement of the Quartet V is a passacaille, but here it is called aria con variazioni. The title of these quartets refers to the use of modulations which can be found in these quartets, but not in a very demonstrative way. These quartets stand out for their equilibrium between counterpoint, harmony and melody. The scoring causes some problems as the title page of the printed edition calls for an oboe and two violins. However, the parts of the first five sonatas mention a transverse flute. In this recording four of these quartets are performed with a flute, the quartets II and IV with an oboe. Some of these pieces have been recorded before; the third quartet is the best-known. As far as I know this is the first complete recording of the whole set. 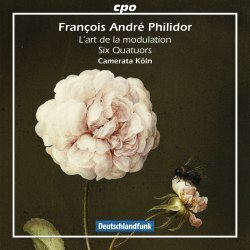 If you like Telemann's Paris quartets you will certainly enjoy these by Philidor as well. They compare quite well with them. This is just very fine music, and the performances are engaging and entertaining. As has been indicated above this is ensemble music; the individual parts may have virtuosic traits, but they should never dominate. That is exactly how Camerata Köln plays them. One could easily imagine these quartets being played at the Concert Spirituel or in the salons of the bourgeoisie. Playing them in your home, albeit through a CD-player, will give you almost an hour of pure delight.